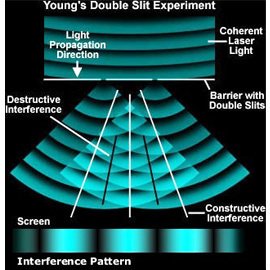 The double-slit experiment is one of the most famous experiments in physics and one with great implications in our understanding of Nature. Although the experiment was realised originally with light, it can be done with any other type of wave. Thomas Young conducted the experiment in the early 1800s. The aim was to allow light to pass through a pair of slits in an opaque screen. Each slit, diffracts the light and thus each acts as an individual light source. When a single slit was open, the light hit a screen with a maximum intensity in the centre and fading away from it. But when there are two slits then the light produces an interference pattern in the screen – a result that would not be expected if light consisted strictly of particles. Although the experiment favours the wave-like description of light, that is not the whole story. This interpretation is at odds with phenomena where light can behave as it is composed of discrete particles, such as the photoelectric effect. Light exhibits properties of both waves and particles, giving rise to the concept of wave-particle duality used in quantum mechanics.